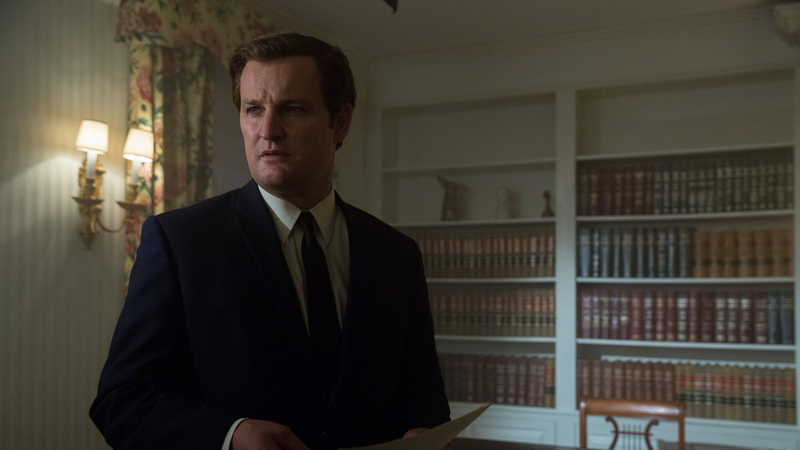 By 1969, Ted Kennedy (played here by Jason Clarke) was the only a surviving brother of the famed political dynasty. But on 18th July of that year, a terrible accident on Chappaquiddick Island, Massachusetts put paid to Kennedy’s presidential aspirations. John Curran’s dramatisation of the incident opens with Mary Jo Kopechne (Kate Mara), one of the so-called boiler-room girls who had worked with Bobby Kennedy on his 1968 Presidential campaign. Mary Jo has joined Senator Ted Kennedy for a reunion party on Chappaquiddick Island. Later that evening, Kopechne goes for a drive with the senator, but a distracted and drunk Kennedy sends the car off a low bridge and into a tidal channel. Kennedy escapes the wreck, but Kopechne is not so lucky. What follows is a series of half-bungled attempts from Kennedy and his staff to cover up his part in Mary Jo’s death and save his political career. Chappaquiddick is a film about living in the shadows. Very much the fourth Kennedy brother, Ted lives under the successes his late brothers Jack and Bobby. And his cousin, Joe Gargan (Ed Helms), pays the price of acting as Ted’s conscience by forever yielding the limelight to the senator, let down by his cousin’s dubious integrity and self-interest. Portrayed by Clarke as a charmed but insecure, Kennedy has all the looks and magnetism of his brothers but little of the acumen, motivated by a desperate need for approval from his patriarchal, infirm father (Bruce Dern). The shadow under which all of the characters labour, of course, is the cover up. Though many assumed a grand conspiracy, Curran’s narrative is constructed of a series of on-the-fly decisions made by disparate individuals, amounting to a barely thought-through cover up. The film follows the conclusions of the January 1970 inquest to show the discrepancies between the real events and Kennedy’s patchy testimony. In depicting the aftermath of the accident, we only see Kennedy sat in shock in the shallows. Later, when he claims that he tried to rescue her, we are shown see that version of events, tainted with unreliable testimony. Political cover-ups, rampant self interest, incompetent in-fighting staff – there are obvious similarities to modern US politics, but if the film is aware of them, it certainly isn’t interested in drawing overt comparisons. Of course, the Kennedy dynasty is a far cry from the current nightmare circus playing out before us. Nevertheless, Chappaquiddick’s biggest failing is in not making the case for the significance of the incident on modern politics. If the crash had never happened, Kennedy may well have become president, and the landscape of American politics would look very different now. Instead, the film ultimately ends up feeling like a shaggy dog story – a metaphor for Ted Kennedy, perhaps – engaging, charismatic, but ending with a whimper. Chappaquiddick is out now in US cinemas.